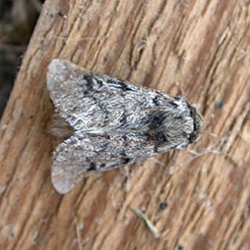 Thaumetopoea pityocampa (Fam: Notodontidae), the Pine Processionary Moth, is an important defoliator of pine trees throughout the Mediterranean. Larvae eat the needles and build a collective web nest under which they shelter and feed. The moths obtained the name from the processionary habits of the caterpillars which at a certain stage, move in a long procession. This caterpillar can also be a public health nuisance as the hairs on the body of the caterpillar can cause dermatitis with intense itching, oedema with or without dermatitis, conjunctivitis and keratitis. If there is eye contact, rhinitis, pharyngitis, and bronchitis can result from penetration in the respiratory tract.